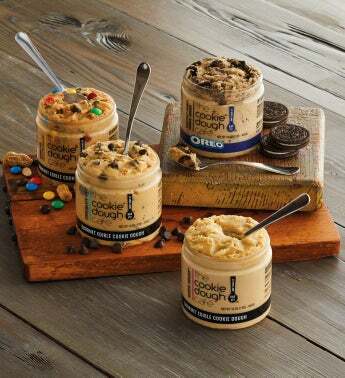 Relive the treasured childhood tradition of sneaking a bite of cookie dough—with none of the guilt. This gourmet cookie dough does not contain eggs and is specifically made to be eaten unbaked, so you can grab a spoon and enjoy, or send it as a sweet and nostalgic gift. This assortment contains four amazing flavors—chocolate chip, Oreo cookie, monster cookie, and naked cookie dough.